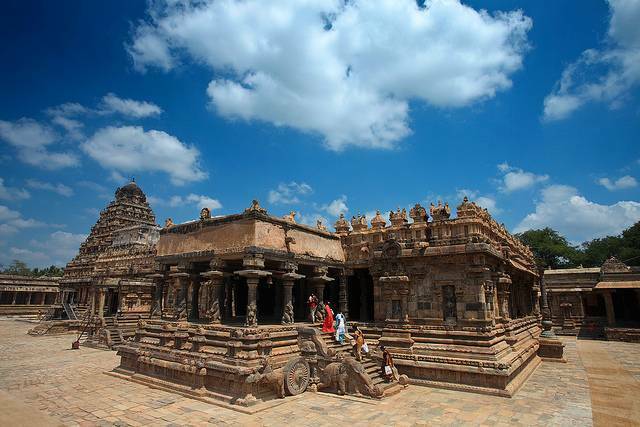 Airavateswara Temple in Darasuram is dedicated to Lord Shiva. The main deity is called as “Airavateswara”. As per Hindu Mythology the white elephant named Airavata (the Vehicle of Lord Indra, the head of Devas), got his original color after taking bath in the tank water here for being cursed by Sage Duruvasar. Lord Shiva relieved him from Curse at this place. The sculptures on the sides of stepping stones are astonishing. Also when Yama got cursed and has burning sensation all over his body, he came down to this place and took bath in the tank. After taking bath and worshipping Lord Shiva in this temple, the burning sensation stopped it seems and so the tank is termed as “Yama Theertham”.